After I have made a number of scrap quilts (not pictured) I have a hankering to make a single line quilt, and that line is S.S. Bluebird, the newest line from Cotton + Steel, whom I love. I apparently happened to be browsing Pink Castle moments after it was released, and managed to snag some yardage of the hotly sought after prints. I mean, I assume they were hotly sought after, because, obviously, everyone agrees with my tastes, right? I am also currently more into simple traditional patterns (not pictured) than doing the whole MODERN quilt thing, so I was looking through one of these 'so you want to make a lot of quilts really quickly' books from the 90s, and found a quilt I really liked, twin sized, which is my thing, and is just 7.5" Double Wrench blocks set on point. I have done like ten minutes of research on this block on the internet and in the books I own. The block itself has many names (Monkey Wrench, and Churn Dash among them) but I will argue for Double Wrench as the correct name, because Double Wrench in the books anyway, does not refer to other blocks, whereas Churn Dash is used as a title 7 distinct blocks in The Quilter's Album of Patchwork Patterns (and anyway I'm pretty sure we all think of Churn Dash as this), and Monkey Wrench has 8. Barbara Brackman's Encyclopedia of Pieced Quilt Patterns has 4 entries for each. You google any of the three names, and you'll come up with both the typical Churn Dash and the Double Wrench. And then some other things. And anyway, what drives me and people like me crazy is that, of course, the names mean nothing! They were used and reused and assigned to blocks that don't even relate to each other. Much like one imagines the state of animal taxonomy was prior to Linneaus. But here is my quick block analysis. The corner units are half square triangle squares, and the center square is half the size. For a Churn Dash, all the subunits are square, a nine patch layout where the center block is the same size as the outside hst units. N.B. 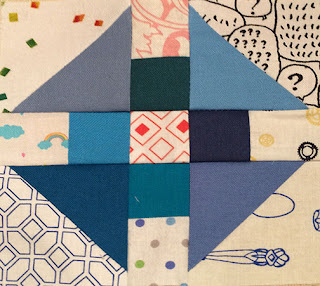 - the hst subunit size is the size of the subunit once the two triangles are sewn together, the finished size of the subunit in the quilt will be (as with the squares) 0.5" smaller. Other sizes are possible, but would require more thought/math. I once sought "correct" names for blocks, then I read some instructions to people doing quilt documenting. "Do not 'correct' the name that the quilt owner gives; part of the project is to unearth the history of naming." I think it went on to say that the name of the quilt is the name the maker/owner gives it. So now I just look at the five or more names a block has assembled to itself and wish I knew, Why?, for each one.